Skateboarding and hip-hop culture have always made good bedfellows--you only need ask Tommy Guerrero. This icon of the sport is just about as famous as a skateboarder can get, yet at the age of thirty-three he decided to hang up his wheels and concentrate on more leisurely pursuits. A Little Bit of Somethin' is the inspired result--an album for which campfires and kicking back must surely have been invented. It's a little bit country, a little bit rock & roll, a Beck-lite collision of postrock blues, breezy summer jazz and whatever else gets pulled out of the rucksack. "Pescadito" is Nirvana's "Come as You Are" stripped down to its drum machine bones; "Soul Miner" oozes hot buttered '70s soul; "4 Track Samba" does exactly what it says on the tin, while "100 Years" is the sound of Ukrainian peasants nodding their heads to a twilight hip-hop mantra. This is a great CD. 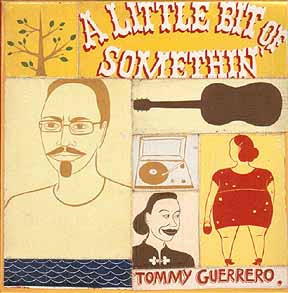 Dude can you repost a working link to download the album "A Little Bit Of Somethin" by Tommy Guerrero. ?